My oldest book, in terms of publication date, is the Memoirs of General Count Rapp, Aide de Camp to Napoleon, published 1823 in London. The book I have owned the longest was a hand-me-down from my father. In the mid-50s, we lived in Alabama while he attended the Air Force’s War College. One of his text books was a book issued by the US Army in 1956, American Military History, 1607-1953. Presumably, my dad also studied air power (this was the Air Force college, after all), but I do not recall seeing any strategic, operational or tactical air studies. In any case, at some point my dad gave the book to me. It was the start of a lifelong immersion in military history, both American and world. The book is a text, and so the generally reliable account serves a purpose other than to educate or entertain the general reading public. Though I did not realize it for many years, the volume had a profound impact on me (not “effect,” but “impact,” as in a single meteor creating the dominion of mammals). On my reading and buying habits, and ultimately my writing. The book’s anonymous authors aimed to educate military officers in the proper application of the principles of war, as exemplified in American military history, especially combat operations. The book’s larger purpose was to help the army transform men and women with officer insignia on their uniforms into leaders, professionals who would identify with the men and women in their commands (small or large), accurately analyze problems (however fluid the situation), make an endless stream of correct decisions, and vigorously supervise the effective execution of those decisions in service of the nation’s survival. Phew! A tall order. The book’s chapters on American warfare from colonial times through Korea are the platform for these lessons in leadership. At the end of each, the reader is asked a series of questions. Some (“What is the significance in American military history of the date 19 April 1775?”) were apparently designed to see if the student paid any attention at all. Others (“Analyze the conduct of both sides at Bunker Hill showing how each did or did not observe each of the nine principles of war.”) were tools to develop the critical thinking skills required of military officers. The book influenced me in several ways. First, at an early age (certainly before age 10), I was exposed to an adult appreciation of the nation’s long and eventful military history, especially its miraculous birth, it’s battle for survival four score and seven years later, and its serial forays onto the world stage, often hesitant and, up to 1953, often decisive. I read through the book’s nearly-500 pages more than once and wanted to know more, about America’s wars, and eventually others. My parents took the hint, as we shall see. I could accurately say that reading American Military History inexorably led me to write my first book, Salt Warriors: Insurgency on the Rio Grande. While earlier historians had viewed the conflict as nothing more than a disgraceful episode in Texas Ranger history, or, less frequently, a dramatic example of Anglo mistreatment of Mexican Americans, my background led me to a far different take. I was the first to examine the El Paso Salt War of 1877 as primarily a military event. For that reason, I was quite pleased by the book’s positive review in the Journal of America’s Military Past. My first attempt at a book was one on the leadership of the French Army during the years of the First Republic and Empire. This grand opus is currently gathering dust, but served as a writer’s incubator. Eventually, this focus on leadership found its way into Salt Warriors and is essential to understanding what happened to the FBI’s investigation into the 1934 kidnapping of June Robles, my current writing project. American Military History was eventually updated to cover operations through 1958. My own university ROTC course in military history (taught by, and I’m not kidding, a Captain Bombard) was based on this already outdated version. I was, I’m sure, the only student in class who had read the book while in elementary school. By 2004, the date of the latest edition, the book had expanded to two volumes, with roughly 900 pages. 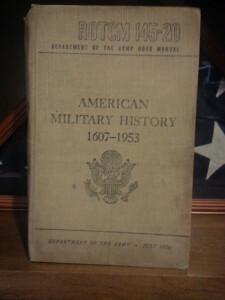 (BTW, these are online at http://www.history.army.mil/books/AMH-V1/.) The 2004 edition includes the 2003 invasion of Iraq. The analysis of the latter conflict and the identification of lessons to be drawn by new officers were premature, to say the least.